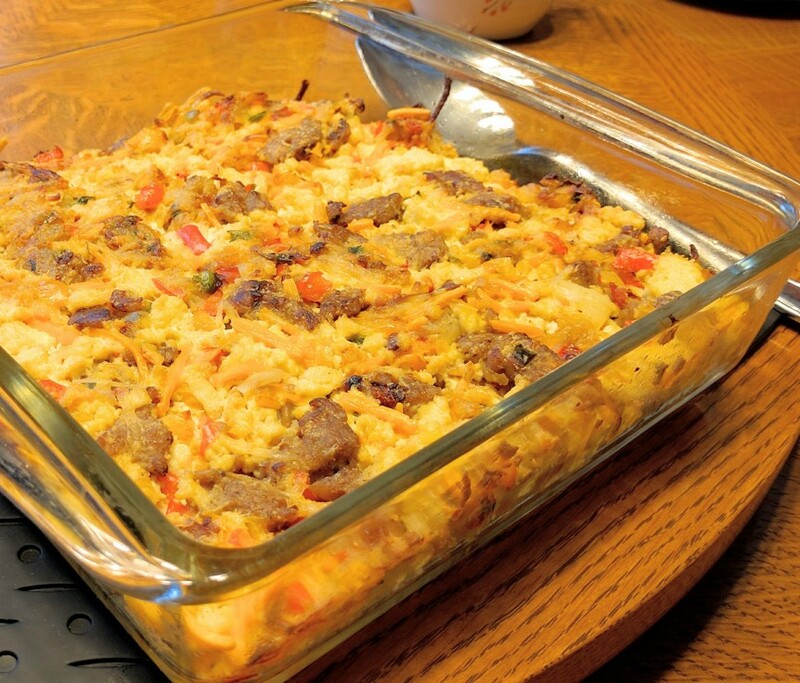 Breakfast Casserole - Vegans Eat What? Vegans Eat What? This casserole is perfect for breakfast or brunch. It can be prepared the day before and refrigerated. In the morning simply cook the casserole and serve with fresh fruit for a hearty start to a great day. Drain tofu and press to remove as much water as possible. Working over a large bowl, squeeze the tofu breaking it into very small pieces. Add the vegan cheddar, garlic and onion powder and mix to combine. Heat a large pan and add oil and wait until it shimmers. Add the sausage and break up into small pieces. Add potatoes and bell peppers to the sausage in pan and cook until potatoes begin to brown. Add the scallions and cook another 3-5 minutes. Add potato-sausage mixture to tofu mixture. Turn oven on to 420 degrees. In an 11x15 baking dish spread out combined ingredients. Place in oven for 20 minutes or until hot. Allow to stand and cool slightly before cutting and serving. You may assemble this the night before, cover and refrigerate, and cook it the next day. The recipe is modified from "Vegan Cooking for Carnivores" by Roberto Martin. It makes a great gift - the book or casserole or both.